Considering entering the Spanish property market? Find out whether 2019 is the ideal time to take the plunge. It’s not difficult to understand why more Brits are entering the Spanish property market than any other nationality of foreign buyers. On top of the flourishing expat communities and abundance of health benefits of the warm climate, Spain also provides the opportunity to enjoy a more favourable relaxed lifestyle, and a lower cost of living. If you’re considering making the move to Spain to make the most of the many benefits, then read on. Here’s what you need to know about whether 2019 is the right time to enter the Spanish property market. How did the Spanish property market fare in 2018? Confidence in the health of the Spanish property market was clearly on the rise in 2018, as the market continued to grow throughout the year. According to the Spanish National Institute of Statistics (INE), nationally, a total of 217,539 homes exchanged hands in the first five months of the year, which was 13% more than the same period in 2017. New homes saw a similar growth, with 38,238 new homes sold across the country, representing 18% of the total number of homes sold. In August 2018, the Tinsa property price index, produced by one of Spain’s largest valuation firms, indicated that prices had increased by 5.6%, based on property valuations carried out by the company. This index showed that summer 2018 saw the biggest growth in average house prices since 2007. The trend continued into the final quarter of the year, with a similar 5.6% increase in November 2018. Leading Spanish property experts widely agree that the market was returning to full strength throughout 2018. Will that trend continue into 2019? Below we have outlined how trusted property forecasters and analysts in Spain view the prospects for the Spanish property market in 2019. What’s the outlook for the Spanish property market in 2019? The Spanish property market is primed to remain buoyant in 2019. Tinsa predicts that prices are likely to continue to rise by 5% to 7% in 2019. As mentioned above, data from the valuation firm showed that house prices rose 5.6% across the country in November 2018, and that the trend is set to continue into next year. The firm predicts that nationwide sales are likely to increase from 500,000 in 2018, to between 625,000 and 650,000 in 2019. Building licenses are also predicted to increase in 2019, in a similar fashion to property sales. Experts predict that the number of licenses awarded will reach 100,000 to 125,000 in 2019. 2019 looks set to be a busy year for the Spanish housing market, with strong demand from both domestic and overseas buyers for the right properties in the right locations. For second home buyers, both beach and golf properties will continue to be top of the priority list. The perennially popular coastal areas are set to welcome many new overseas buyers in 2019. Here at Spanish Legal Homes, we have over 500 ‘key ready’ properties on our books including Costa Blanca property, Murcia property and Costa Del Sol property to satisfy the need for Spanish properties for these new buyers. At Spanish Legal Homes, Spanish golf properties are also one of our property specialisms, learn more in our guide to finding your ideal golf property in Spain. What will you make on your Spanish property investment in 2019? One of the largest Spanish banks, BBVA, has predicted that 2018 will end with an average 5% house price growth across the country. Similarly, rental prices are also growing at double-digit rates too. The BBVA bank also expects the number of overseas buyers to rise in 2019. Figures from the Spanish Notaries show that 53,359 Spanish homes were bought by overseas buyers in the first six months of 2018. Sales were much higher in the first half of 2018 than the previous record high of 33,000 sales to this market in the same period in 2007, at the peak of the Spanish property market. Experts expect the trend of growing numbers of overseas buyers to continue into 2019, so if you already have a home in Spain that you’re looking to sell or rent out, the future looks positive. With banks and property analysts predicting significant average price rises, rental prices on the increase, and a trend towards record numbers of overseas buyers, 2019 is set to be another buoyant year for the Spanish property market. If you’ve decided that 2019 is the ideal time to take the plunge to buy your dream home in Spain, you’re in the right place. Spanish Legal Homes have over 500 ‘key ready’ Spanish properties on our books. What’s more, our experienced and friendly team are ready to offer expert advice on every aspect of purchasing a property in Spain. Since 1985, Spanish Legal Homes have helped over 10,000 happy clients safely purchase a home in Spain. If you’re serious about wanting to find your dream home in Spain, we would always recommend booking a trip to view potential properties in person before you buy. We offer all-inclusive property viewing trips for just £99 per person, during which we will show you 8–10 properties a day that match your requirements. 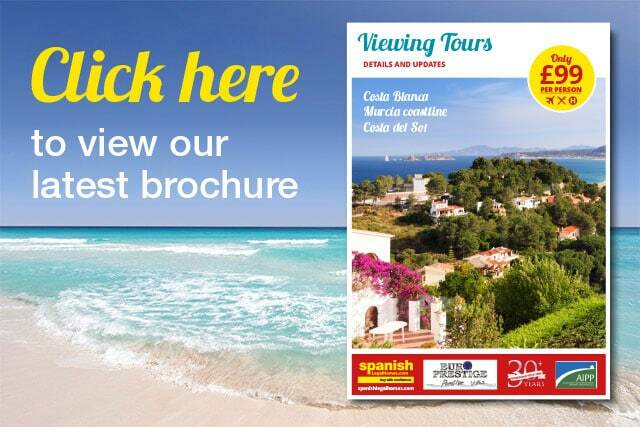 Book your property viewing trip today or call 01202 971614 to find out more about viewing and buying Spanish property.